LAS VEGAS, Nev. -- A man riding on a double decker bus on the Las Vegas Strip pulled a gun and started shooting, killing one person and wounding another before barricading himself inside in a standoff that lasted hours before he finally surrendered. 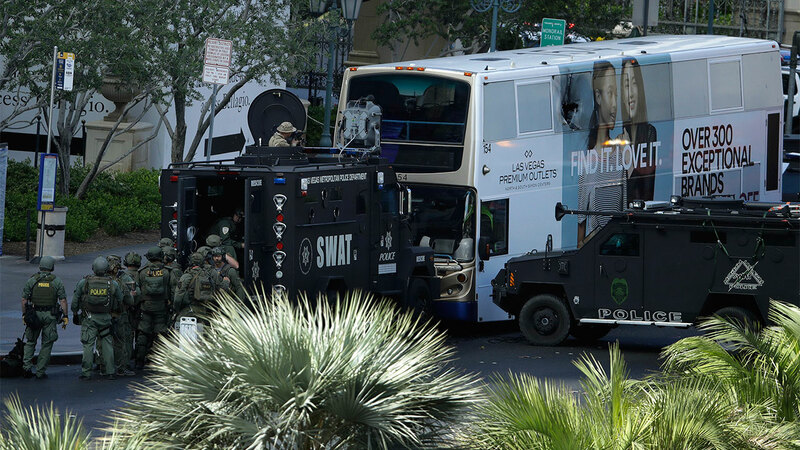 The standoff began about 11 a.m. Saturday on the double-decker bus when it was stopped on Las Vegas Boulevard near the Cosmopolitan hotel-casino. "He was on the bus. He was shooting people on the bus. He was just contained to that location. He never exited the bus," Clark County Assistant Sheriff Tom Roberts said. Two people were taken to the hospital after the shooting, University Medical Center spokeswoman Danita Cohen said. One died, and the other was in fair condition. For hours, crisis negotiators, robots and armored vehicles surrounded the bus with authorities uncertain if there were any more victims inside. Meanwhile, officers swept into the casinos to warn tourists to bunker down until further notice, leaving these normally bustling pedestrian areas and a road notorious for taxi-to-taxi traffic completely empty. The Strip, normally crowded with cars and people, was shut down for blocks in both directions. Some in the Cosmopolitan - hotel guests out over their balconies, party people on the pool deck - saw the tense situation unfold below. Former NBA player Scot Pollard, who is staying at the Cosmopolitan, told The Associated Press by phone that he was at a bar at the hotel-casino around 11 a.m. when he saw several people, including staff, running through the area toward the casino and repeatedly screaming "get out of the way." After he was told that the area would be closed, he went back to his room, which oversees the Strip. "We can hear them negotiating. We can hear them saying things like 'No one else needs to get hurt,' 'Come out with your hands up. We are not going anywhere. We are not leaving,' " he said. Visitors were also hiding out inside some of the other prominent casino properties affected, including the Bellagio, Paris, Planet Hollywood and Bally, which in addition to hotels and casinos also hold restaurants, shops and attractions. Las Vegas Police officer Larry Hadfield said just before 3:30 p.m. that the man, who had a handgun, surrendered without incident. Police did not open fire and said they believe the man is the only suspect. Terrorism or any connection to an earlier robbery nearby that shut down a part of the Bellagio has been ruled out. No other information about the man has been released. By 4 p.m., pedestrians were back in the area and northbound traffic on Las Vegas boulevard had reopened while investigators worked to clean up the other lane where the bus was still grounded. The bus is operated by the Regional Transportation Commission of Southern Nevada.